Based on the latest post about Tiara Miramar Beach Hotel, I was also invited to visit Tiara Yaktsa Côte d’Azur, another of the hotel’s sister properties. Its magnificent views over the blue sea and the intoxicating scents of its manicured gardens gave me the real well-being. Probably Europe’s most romantic hotel, has been already secured first place in the ranking of the most romantic hotels in Europe in January 2011, also awarded from TripAdvisor when they Travellers Choice Awards 2012 under 25 best hotels in France. The Tiara Yaktsa Côte d’Azur, is a boutique hotel with unique charm, nestled in the seaside town of Théoule-sur-Mer, it’s a haven of peace and tranquility. Embraced by the vibrant blue colored Mediterranean sea and dominated by the Esterel range, the Théoule-sur-Mer region is a land of contrasts. Sea and mountains nestle naturally. For those headed toward Cannes, Théoule-sur-Mer is the first commune in the Alpes Maritimes. A former fishing port, the charming maritime enclave is now home to no fewer than 4 yachting harbors. Locals are highly attentive to the quality of life in this still relatively unknown corner of paradise thus assuring a prestige destination. In this unspoiled setting, delicate pine-wood scents surround The Hotel Tiara Yaktsa Côte d’Azur. The 5-star Hôtel Tiara Yaktsa Côte d’Azur has 21 rooms and suites. 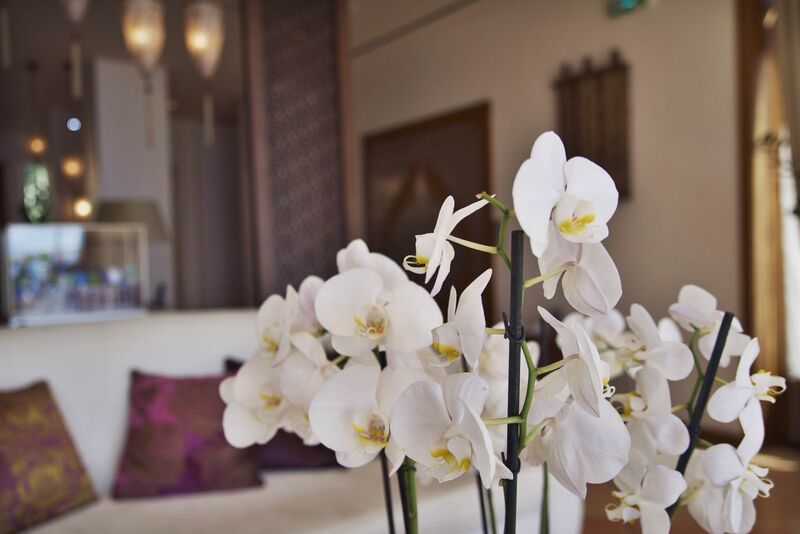 All rooms are decorated in luxurious oriental chic decor and delightful touches. The Superior Rooms offer cosy and spacious surroundings. 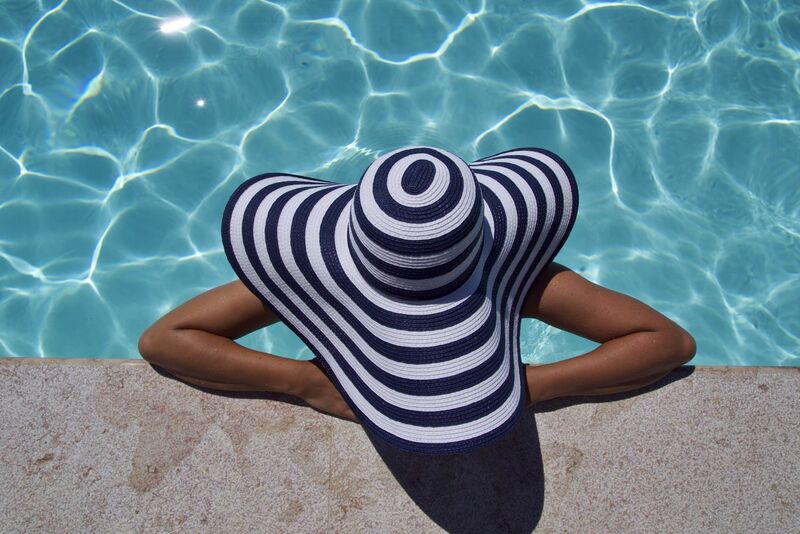 Every guest experience a wonderful scenery in Côte d’Azur flair of refinement and total relaxation. Every room has a wonderful sea overview and these are unforgettable picturesque views that will always stay on your mind. 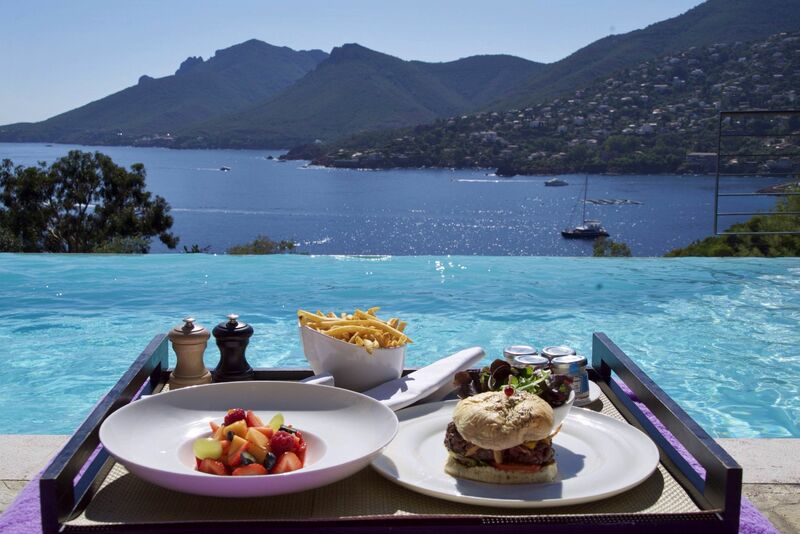 We were able to spend a day at the Hôtel Tiara Yaktsa Côte d’Azur, to sunbath by the hotel’s infinity pool and to enjoy the 5-star “L’or Bleu Restaurant“. This restaurant is a true celebration of the Mediterranean sea and sky, stunning tastes with unique ingredients. We had an unforgettable dining experience hosted by Chef Guillaume Anor. With a spectacular bay view on the most glamorous terraces, the gourmet restaurant at Hotel Tiara Yaktsa Côte d’Azur was an unforgettable night. For dinner I choose the starter “Shrimps in Cocktail Style, with fruit tartar, basil and spicy Guacamole”, companioned with the main dish “Loin of Lamb wrapped in Kadaif and baby purple artichokes” – my personal favorite, and cherry on the top the sweet note “Roasted apricot, rosemary flavored, crunchy tuile with apricots”. Everything was mind-blowing delicious and a wonderful dinner experience! The Hotel Tiara Yaktsa Côte d’Azur, ensures the well-being of the guests. The hotel’s beauty center is a perfect place to relax with a personalized selection of massages. With signature Sothys body care treatments sooth the spirit. You can choose from manicure, to waxing or a make-up session to complete your personal care. The fitness center faces the bay yet is shielded from the terrace overlooking the hotel pool. 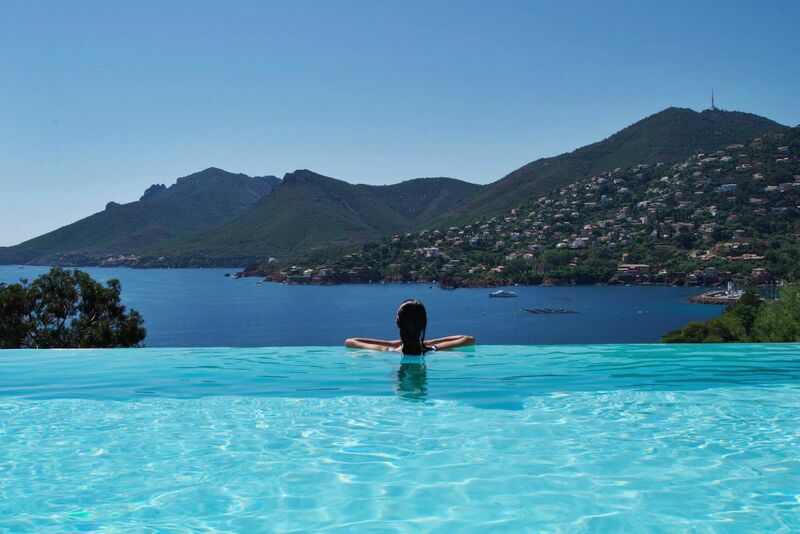 Inspired by the beauty of the Orient, the Hôtel Tiara Yaktsa Côte d’Azur is heaven of tranquility. Best view ver the cobalt blue Mediterranean sea. Not just the hotel’s location is quite spectacular, but it is the serenity that I found here and that was the greatest thing I experienced after coming from the big noisy city. Located just below a garden of Eden, the hotel’s pool is the jewel in the crown of Hotel Tiara Yaktsa Côte d’Azur surroundings. Those who follow me on Instagram, have already seen this photo, but I can’t help it and show it again because this Tiara Burger and the mix-fruit-salad was beyond delicious. Oh, and this view tho! This was our dinner table with a spectacular view over the sea and the Esterel foothills which are located between Saint-Raphaël and Mandelieu. 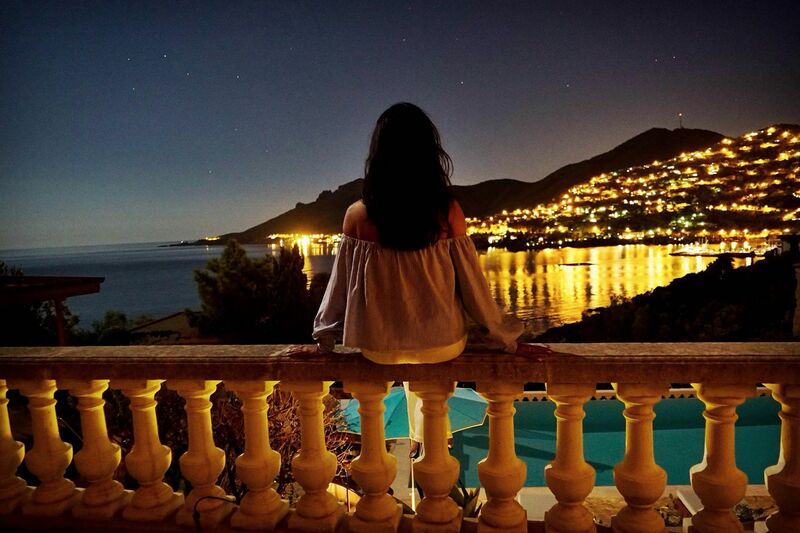 After dinner, we enjoyed the full moon and the wonderful view from the Hotel Tiara Yaktsa Côte d’Azur pool terrace. Everything about my dinner outfit, I will show you in another post. The moment I entered Hotel Tiara Yaktsa, I knew it’s a special place. Greeted by blue skies and yacht-dotted seas, there’s an earthy Moroccan theme in harmony of wood furniture and terracotta tiles. Impressed by its gorgeous gardens, the elegant restaurant, and staff who welcomed us like a family. 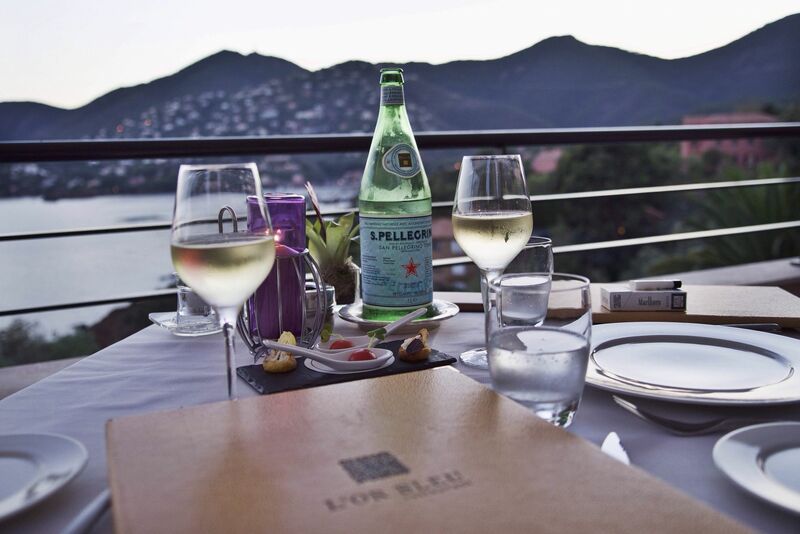 Clearly, the “L’or Bleu Restaurant” was the best restaurant I have ever been before. The taste of the food and the visual setting of every dish was just spectacular. You should choose to spend your days and nights at Tiara Yaktsa , that will everyday take your breath away. Na dir geht’s gut tolle Bilder und tolles Hotel!